California’s Top Two Primary has undergone what a political cardiologist—if there was such a thing-- might call a "stress test." The hand-wringing in advance of California's June primary (mostly by political partisans) was a constant in the two weeks before the election. But after the people voted, a lot of the dark clouds that people had been describing simply dissipated. The reforms that California voters have passed — citizens redistricting, the top-two primary and term limit reforms — are receiving credit from many for changing California from a state that was once famously described as “ungovernable” to one which is becoming a model of good governance. At California Forward, we believe the top-two primary process has increased voter choice, reduced partisan gridlock and enabled lawmakers to address significant problems through principled compromises. California Forward also believes the primary process can be further improved and will work with partners to identify and when appropriate promote those improvements. Such refinements would continue the positive evolution of governance in California so that elected officials are more representative, responsive and accountable. In a recent commentary by CA Fwd Co-chairs Lenny Mendonca and Pete Weber, they noted that recent interviews with legislators and leaders outside government suggest that Top Two and other reforms are beginning to break up the outsized influence of special interests and shift that influence back to voters, where it belongs. Imagine having four candidates to pick from in a November election rather than the current two? And then you get to rank them one through four. That’s an idea being developed by the Independent Voter Project (IVP) which is developing model legislation that will be submitted to the National Conference of State Legislators and the American Legislative Exchange Council. There are already many recent examples of new approaches to picking candidates. Here in California, voters passed Prop 14 in 2010 which gives every voter the right to vote for all candidates in primary elections, giving politicians an incentive to appeal to all voters in their district and we’ve been using the top-two primary since for legislative and Congressional contests. The San Francisco Mayor’s race this month used the ranked-preference system, where voters can list up to three candidates. If no one receives a majority on the first ballot, the contender with the fewest votes is eliminated, and the second-choice votes are added to the remaining candidates’ totals. It resulted in the closest mayoral race there since 1995. And Maine voters have just passed a model that will let voters to rank candidates in order of preference instead of choosing just one. If no candidate wins an outright majority, the candidate with the least first-place votes is eliminated and his or her second-place votes are distributed to the remaining candidates. IVP issued a press release saying the idea being developed of a non-partisan top-four primary would increase candidate access to the general election ballot, give voters more choice and ensure that the candidate elected in November (when the most people vote) is determined by a majority of voters. 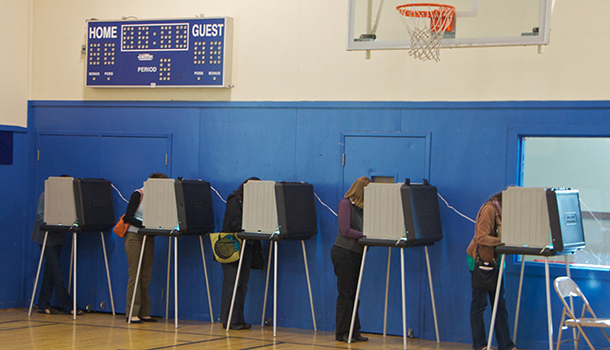 IVP, California Forward, the National Association of Non-Partisan Reformers (NANR) and FairVote have been working together to explore and suggest new election models that maintain and advance voter-centric reform. "CA Fwd has been a strong advocate for citizens redistricting, the top-two primary and term limit reform, and believes these reforms have reduced partisan gridlock and encouraged bipartisan compromises," added Mendonca. "We are always looking for ways to continue and enhance these reforms to improve voter's choice." We are interested to see what this model legislation looks like.